So, what’s an air fryer, exactly? 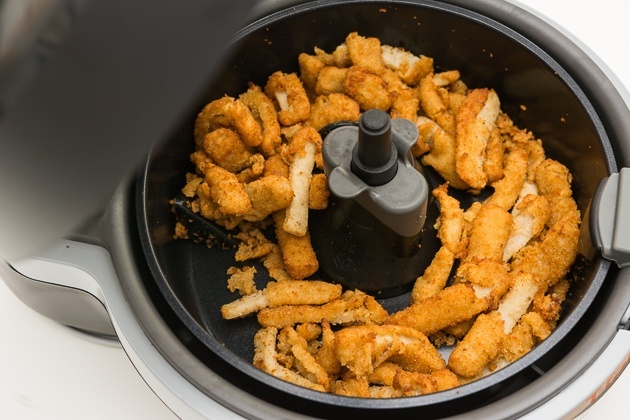 This magical gadget basically “fries” food by using a tiny bit of oil and hot air in order to dehydrate and cook whatever you’re using. So those fried mozzarella sticks will get a crisp, breaded texture but with only half the fat. Is it worth it? And does it taste the same? Here are a few mouthwatering recipes so you can find out for yourself. 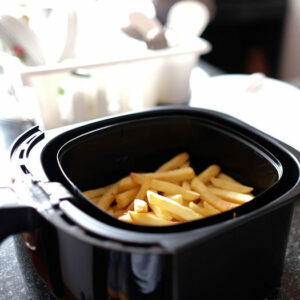 Apparently, the air fryer doesn’t just “fry” foods, but it can mimic the texture of baking them, too. 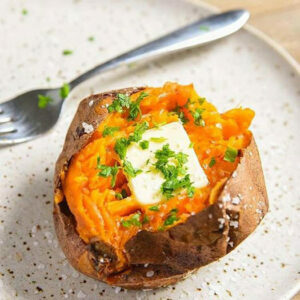 Thanks to the air fryer, you can enjoy a rich, baked sweet potato using no oil whatsoever. Sweet potatoes are high in antioxidants and fiber, which keep you fuller longer and keep your heart and skin healthy, so it’s an excellent starchy side or lunch option. (Try stuffing your sweet potato with black beans, cheese, and avocado.) And even if you do use a tablespoon of olive oil, the finished product will only be 153 calories a serving. 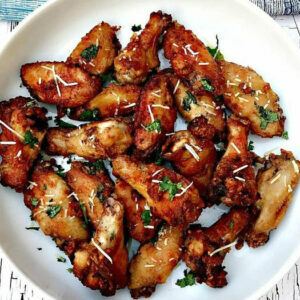 Love fried chicken wings but hate all that excess oil and fat? The air fryer is the solution. 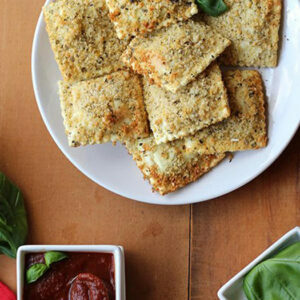 Breading them with Parmesan helps nix even more calories and fat. 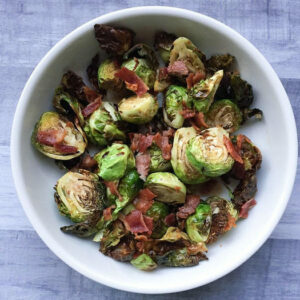 Each serving has only 274 calories and 15 grams of fat, which keeps the count especially low without jeopardizing that comfort-food flavor. The best part? You can have a full plate of wings ready in only 30 minutes. Have you ever ordered a fried tofu dish from Chinese takeout thinking the tofu automatically made it healthier than a meat dish? Not so fast; that tofu is still fried. 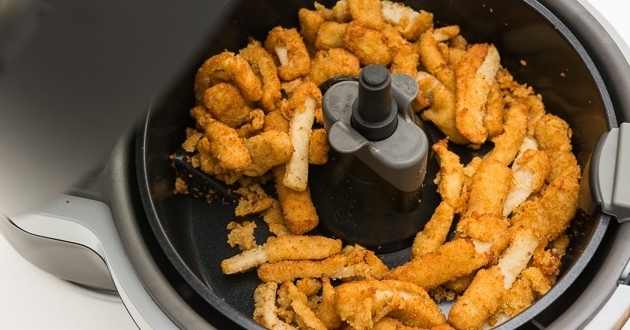 The air fryer will give you that crisp outer layer, but without all the greasiness. 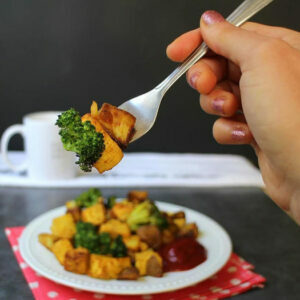 Try this air fryer scramble for a tofu dish that truly is healthier takeout food you can make at home. 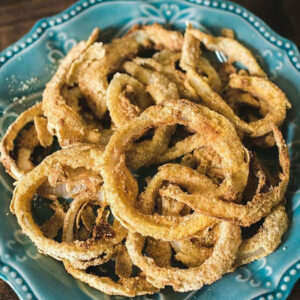 There’s nothing like a side of crunchy, flaky onion rings to go alongside (or on) a burger. The only problem with those rings is that they’re usually deep-fried in oil with breading just as thick as the onion underneath. These gluten- and dairy-free onion rings are a healthier option and even have a touch of cayenne and paprika for a spicy kick.